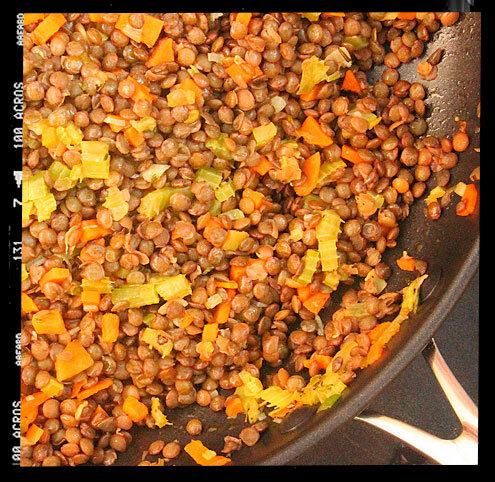 Start by rinsing the lentils, putting them in a large saucepan and pouring over enough cold water to cover them by about 7cm. Do not add any salt at this stage as this can lead to tough lentils. Bring to the boil and simmer for about 25 minutes or until tender but still retaining a little bite. Check regularly and top up the water if necessary. When cooked, drain and refresh in cold water. Meanwhile, heat some oil in a large heavy-bottomed frying pan and add the carrots, onion, celery, garlic and thyme along with a generous seasoning of salt and pepper. Cook gently for about 10 minutes or until the vegetables are softened and translucent. 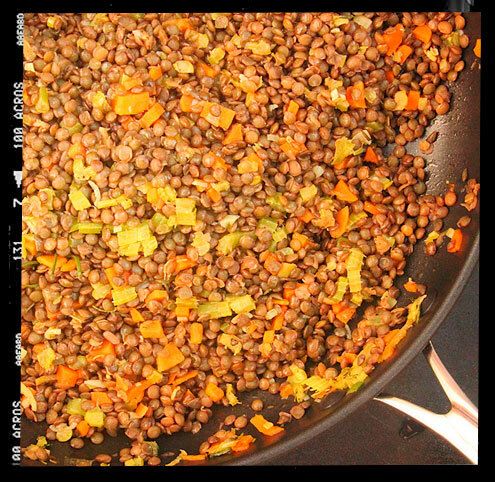 Add the lentils and set aside. Start by making a mustard dressing: mix together the mustard and vinegar with 3 tbsp of olive oil. 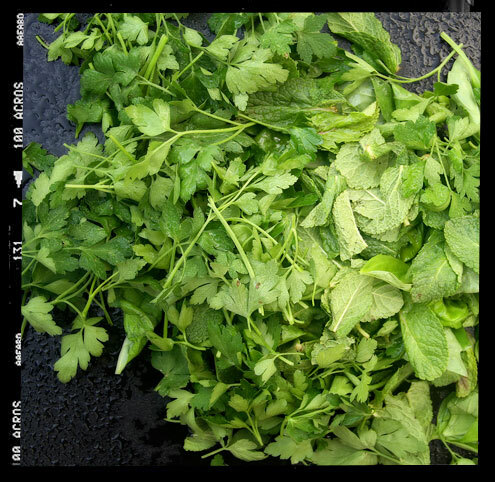 Add a little salt to taste.Next finely chop all the herbs, capers and gherkins. Place in a bowl and add the mustard dress along with enough olive oil to make it pourable. Taste and season with salt and pepper. At this stage it is best to reheat your lentils as the cod cheeks take no time to cook. 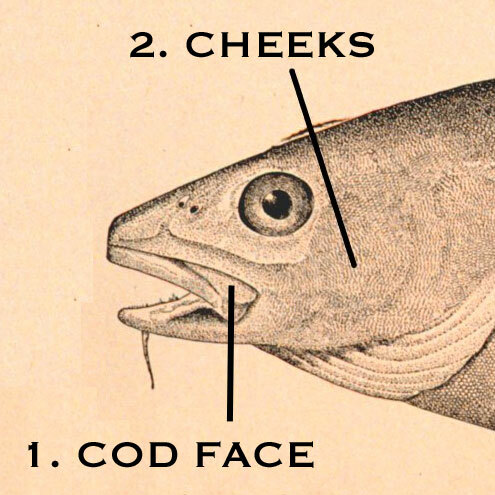 Wash the cod cheeks (removing any bits you don’t like the look of) and pat dry with kitchen towel. Put in a bowl, season well and pour over enough olive oil to coat. Heat a heavy bottomed frying pan. 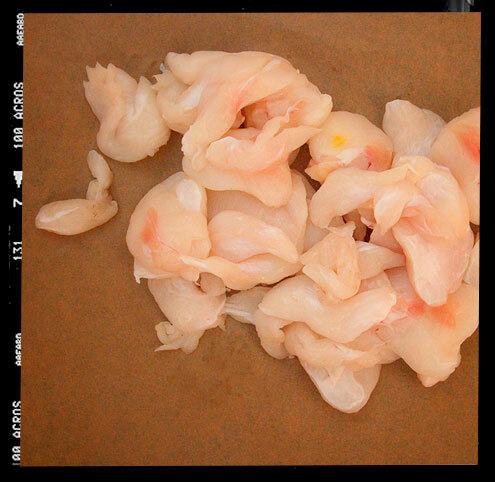 Tip in the cod cheeks and cook for about 2 minutes on both sides, adding the chopped garlic for the last minute. Finish with a squeeze of lemon juice. Put your lentils on a heated serving dish, tip over the still sizzling cod cheeks and then spoon over the salsa verde. We served ours with buttery purple sprouting broccoli and some good bread to soak up the sauce. 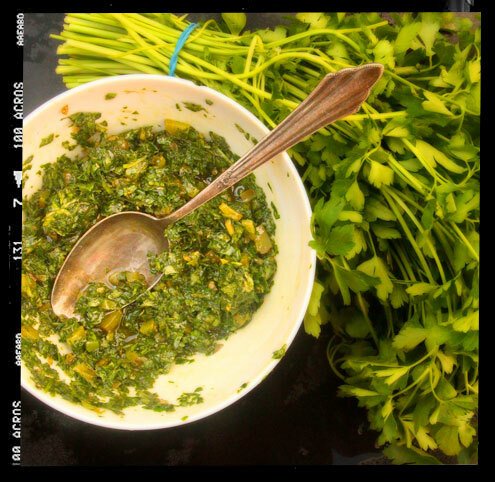 The lentils are earthy and meaty, the cod cheeks succulent like scallops and the salsa verde herby and piquant. A very special dish indeed which was tried and tested on two pairs of guests on consecutive Saturdays. One of them, the Frenchman, licked the serving bowl clean, and in this era of fake internet testimonials, that is testament indeed. Customers who enjoyed this puy lentil dish also enjoyed this ‘Ragout of lentils with smoked haddock and horseradish cream‘ and this ‘Soft cheese, puy lentil and parsley salad‘. Drink: Over the course of two weekends? An impressive amount including a batch of last years Sloe Gin.